I deal with change on a constant basis. A large part of Imagine’s purpose is to guide companies and sales teams through the transformation that enables them to become Demand Creators. Change has always fascinated me. From the earliest time I can remember, I’ve always believed that people can do, and be, whatever they chose, and that people do not need to be stuck in a rut. I’ve always believed that change is possible. I guess that’s why I’ve always been attracted to a variety of theories about how to change successfully. The more I’ve read about it, the more frequently I am disappointed with what’s written. Books and articles either gloss over the challenges of change (I call this the affirmation school) or they dig so deep into the details that I don’t even know where to start (I call this the professorial approach). On occasion, I come across insights that fall in the middle. Thoughts that address the challenges faced by changing in a thoughtful and effective manner, yet maintain an action-oriented format that allow readers to implement the ideas quickly and effectively. It is for this reason that I highly recommend you read Switch: How to Change Things When Change Is Hard when it comes out next month. I received a pre-release copy of the book and have found it highly effective and insightful. Of course, I shouldn’t be surprised as the authors are Chip and Dan Heath – who wrote the instant classic Making It Stick. Switch doesn’t rely on the overly simplistic idea that you must appeal to the emotional side, it clearly communicates that effective change initiatives integrate all three. I’ll let you read the book for the details. 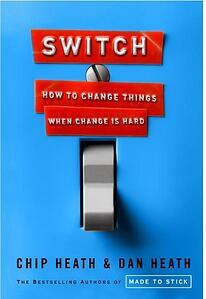 In a world where the only constant is change, The Switch gives you a path to thrive. Read it.